Taking place in the past it offers a view at the Saiyuuki quartet before their formation and their journey to the west. First OVA starts with Sanzo and his master, also with Ukoku (known as a later Ni Jianyi). Second OVA shows first meeting of Goku and Sanzo. Third OVA considers the events after Hakkai's sins and his trial (that we know from first season of "Saiyuuki") and his decision to live in Gojyo's house. Before watching Saiyuki Burial, I suggest you at least watch Gensoumaden Saiyuki or be up to speed on the manga. It may be a prequel to the series, but it is always good to have some insight on the characters. And if you've seen the other three seasons, then don't go into Burial expecting the light-heartedness and filler that the other seasons were. Burial is very dark, and the light moments are very scarce. Also, SHOUNEN AI hints. Nothing too bad, but it's definitely noticeable. 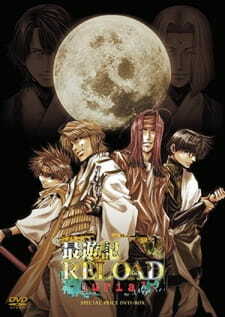 Story: The regular story of Saiyuki is based on Xi You Ji -- or, Journey to the West, as known in English. It is an ancient Chinese folktale about a monk, a Kappa [water sprite], a pig demon, and the monkey king going on a journey to India to stop the evil Gyumao. Saiyuki Burial is the prequel to Gensoumaden Saiyuki, and focuses on how all of the characters met each other, and their relationships.The first OVA focuses on Genjyo Sanzo, the priest in question, as a child. His adoptive father meets a young priest named Ken'yuu that is trying to become a Sanzo Priest (As Sanzo is the title of the highest ranking priest). The second OVA focuses on a grown-up version of Sanzo, and how he is hearing a mysterious "voice" calling him. He follows the voice to a mysterious mountain far, far away that all of the villagers say that there is, supposedly, a monster sealed up there. Art: Compared to Gensoumaden, Reload, and Gunlock, the art was beautiful. I really enjoyed it, especially the shading. It took me by complete surprise. Sound: I enjoyed the opening song; it fit the theme of the show very well. It was very eerie and it really set my hopes high for the show. The music was eerie when it needed to be, and it helped set the theme of the show. Enjoyment: I've loved these characters for a long time, and although I read OVA2 and OVA3 in the manga, I enjoyed it very much. I always thought it was such a shame that the art was awful in Gesoumaden (Due to its age; it's rather old), and it really didn't do the characters justice. I enjoyed learning about Ken'yuu and how he knew Koumyou (As it was hinted throughout the previous seasons), and little Goku tagging along after Sanzo like a lost puppy was just too adorable NOT to love. Hakkai being jealous over Banri was adorable, too. Art: 7/10 - this was too sharp for my taste since i did not particularly like the long faces... the most weird part for me is that Gojyo's eyes can be seen behind his red/purple hair... also, characters kinda looked the same... where's the originality?